This is the kind of use of technology I really love. 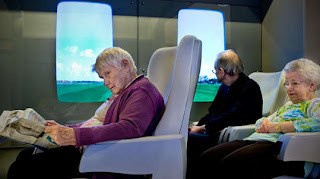 For people at an elderly home who suffer from Alzheimers or dementia, the designers converted an ordinary lobby space into a replica of a (roomy) train, and the "windows" are video screens that desplay a Dutch countryside slowly rolling past, with cows, windmills, clouds and trees. They even have people in costume come by to collect tickets and serve coffee. I guess some people might not like this idea because it could be seen as too fake or demeaning to the people because they're being tricked. But they love it! And for people who are not physically or mentally in shape to do much outside the walls of the home, what a nice option. One row of seats side by side for people who feel like chatting, one row of single seats for people who just want to gaze out the window or read a newspaper. Kudos to the artists behind it, Lino Hellings and Yvonne Dröge Wendel. 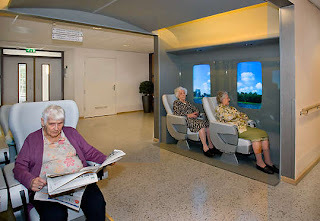 It's installed at nursing home "De Bieslandhof" in Delft. There's more information in English on the project on the website of "SKOR", Dutch acronym meaning for the Institute for Culture in Public Spaces." Awesome that such an institute exists. Unfortunately, the website is a little cluttered. The artists' own website details the ENTIRE process, from conception to completion, at www.bies.nu (but that's in Dutch). "We discover an old steam train between Hoorn and Medemblik. The windows are perfect, as is the speed. We use old socks filled with coffee beans to stabilize the camera..."
Hardly a convinving experience since this train is always on time and never has leaves on the tracks. I think it's a great idea! Whatever makes them happy really! Love the first comment.. totally agree! It reminds me of one of my favorite tv commercials. Sailboat silhouetted against an orange-sky sunset with a voice-over, "Experience life, on CNN". Thanks for two comments that actually made me laugh.